A traditional style piano for the 21st century. The classic upright piano takes on the whole new dimension with the Suzuki VG-88 vertical grand console digital piano. Designed to create exciting music performances at home or school, the VG-88 has an impressive list of professional features not the least of which is affordability. 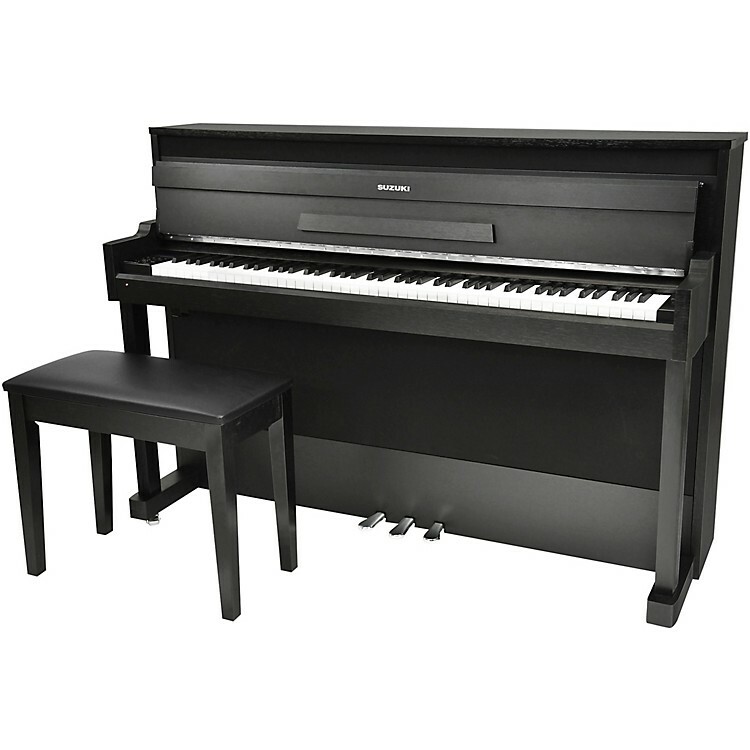 Priced below any comparable Digital Piano in its class, the VG-88 includes state of the art electronics housed in a beautiful furniture quality cabinet. Teacher and student share the keyboard with twin function. An amazing 9 layer, 1GB Grand Piano Voice is projected through 4 way enhanced stereo sound delivery system. Connect with smart phones and tablets using the Bluetooth system and play along with your favorite artists. Add Digital Reverb, String and Pedal resonance and an entire list of performance features that make the Suzuki VG-88 your Traditional Piano that Outperforms. The VG-88 has a velocity sensitive, graded hammer action keyboard that offers superb response and smooth feel.Suzuki's acclaimed sound imaging technology and 1 GB extra large grand piano voice are used to create remarkable depth, expression and realism. Instrument voices use 3D sound source sampling for incredible dynamic response. 128 GM voices and recording features create endless musical possibilities. Professional styles make you a member of the world class band of your choice. Rock to Bach, World Beat to Jazz ensembles, Boogie Woogie to New Age, your musical spectrum is limitless. The VG-88 features a powerful 4 speaker sound delivery system. High grade speakers and integrated tuned cabinet deliver a truly dynamic sound, rich with presence and power. As a tech titan, the VG-88 includes the latest Bluetooth technology. Wireless networking enables any wireless device to connect to your VG-88 Digital Grand Piano for expanded and convenient operation. 189 note polyphony ensures no dropped notes even with the most complex piano passages. Digital signal processing (reverb, chorus and EQ) allows you to sound sculpt your performance to your personal style and taste. The layer and split piano functions with sound balance controls guarantee beautiful, rich, full sounding instrumentation. A musical statement for any room in your home!